Telecommunications innovator, Vonex (ASX:VN8), continues to deliver consistent user growth, reaching a record-smashing 26,000 registered PBX (private branch exchange) users. Growth in cloud-based PBX registrations is a key indicator of Vonex’s business development progress as it hones in on the multi-billion-dollar Australian market for telco services to small and medium enterprises (SMEs). 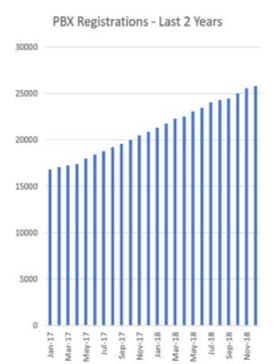 The image below shows VN8’s delivery of consistent growth in PBX registrations over the past two years. In the last 12 months, Vonex has grown its PBX user base by around 22% — up from 21,000 users as at January 2018. Factors driving this customer and user growth include the continued rollout of the NBN in metropolitan areas, the company’s commencement of online marketing to all states late last year following completion of pilot marketing testing, as well as improved engagement with new and existing channel partners. Vonex’s channel partners are helping to accelerate its business growth by selling the company’s proprietary technologies, including its cloud-based PBX and Vonex-branded traditional mobile, internet and business phone systems. Registered PBX users are continuing to grow at a rate of approximately 500 users per month and are expected to accelerate as stage two of Vonex’s marketing program gains traction, continuing to target Australia’s capital cities. Vonex is a full service, award-winning telecommunications service provider, selling mobile, internet, traditional fixed lines, and hosted PBX and VoIP services — predominately to SME customers under the Vonex brand. Its platform clients include the likes of Menulog, Groupon, Deliveroo, Australian Federal Police and Air India. It also provides wholesale customers, such as internet service providers, with access to the core Vonex PBX and call termination services via a white label model. On top of that, VN8 develops new technologies in the telecommunications industry, including a feature-rich cloud-hosted PBX system. It’s also developing the Oper8tor app — a multi-platform real-time voice, messaging and social media app that allows users to connect with all social media friends, followers and contacts across multiple social media networks, all consolidated into one app.